Who knew fiber could taste so good? Have you had your fiber today? If you haven’t, it’s time to get moving… literally! If you avoid it because of the fear of bloating, let me first give you a few bits of information. An increase in fiber at first might cause a temporary bloated feeling. However, this extra fiber can eventually flatten your tummy even more so once “things get moving” in your digestive tract! You see, fiber adds bulk, which (aside from keeping us dieters feeling fuller longer) helps everything move and groove through the intestines more quickly. Thus, if you’re feeling jammed up, this fiber can relieve you of that excess waste; your body just needs time to adjust to processing this increased bulk. I have two suggestions to help mitigate the bloat on a daily basis: 1) Don’t eat more than the RDA— too much of a good thing is still, well… too much. 2) Take a good digestive enzyme with your meals. 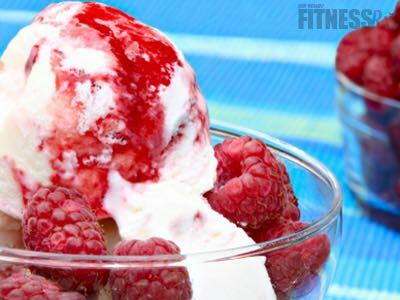 Today I’m providing you with a delicious way to get started… Berry-Nutty “Ice Cream”! 1. Mix protein powder, pudding mix, flaxseed, almond milk and water in a bowl until smooth. 2. Add almonds and berries and stir well (I prefer to stir extra hard to crush the berries into the mixture). 3. Put in the freezer for about 20-30 minutes until it’s ice cold and somewhat frozen (the longer that you leave it in the freezer, the harder it will get— adjust according to your preference). 4. Enjoy…and then enjoy some more! Per serving (serves 1): 330 calories, 33 grams protein, 27 grams carbohydrates, 10 grams fat, 9 grams fiber!